Stock Problems/Issues Discussions related to warranty related issues and repairs, or other problems with the OEM parts and software for MINI Clubman (R55), Cooper and Cooper S(R56), and Cabrio (R57). i'm trying to replace the water pipe btw the water pump and thermostat. it's all out but i'm having difficulty getting the new one in place at the water pump end. the o-ring on the pipe will not fit into the water pump housing. if i remove the o-ring and slide the pipe in it fits in nicely. but no go with the o-ring on. how do i get it to fit? any advice? Did you insure that all plastic debris has been removed? I just pulled one of those pipes the other day and plastic from the pipe remained in the opening. Old and new pipe. Top photo still has o ring on it. All of the plastic you see missing in the above pipe was still sitting in the opening after I removed the pipe. The cooling system was not leaking. I have the intake off so it was easy for me to see the opening. I've seen this from the plastic being broke off like that in the pump. But also seen the aftermarket plastic coolant pipe not fit right so make sure you have an original MINI one. there is no debris in the opening. manifold is off and i cleaned the opening out. also replaced the water pump. ordered the part using mini part number. i assume it's the right one. still can't get the pipe in with the o ring on. i can remove the o ring and pipe fits. just can't get it in with o ring on. i pushed as hard as i can and it won't go in. do i just need more strength or is something wrong? Maybe try a bit of lube on the o-ring --- outer surface? Ordering by PN doesn't ensure anything unless it's from a Mini dealer. If a lubed o-ring doesn't work, take the parts back and get OEM. ^^ +1 Yep, make sure the plastic is not stuff in there and clean the edge. You can see it sometimes from the water pump removal, then grease it and insert like above. When installed it should look slike this in the backside of the waterpump housing. so YUPETC, i take it you mean i should set the pipe in place at the water pump side, then allow it to be "set" into place as the thermostat bolts are tightened. will try that. ECSTuning (or anyone) i'm hoping i don't need to have the water pump off as i install the water pipe b/c i've already got that - the water pump - all put back together again. thanks for the advice. Nope, you don't need to have the waterpump off. I thought if you have it off. it would help you see it seat on the housing. Also, see any broken off pieces that are stuck. I used spray silicone on that end. Make sure to orient the tube as the bend in it may hinder the install. The o-ring seats inside the opening. Be sure you use silicone lubricant and that the tube is going in at the correct angle/positioning. Yep, if it still does not fit might be a bad unit that was not made to spec? We've seen this before from aftermarket water pipes. They are cheap and it's for a reason. It's just off enough to make it not fit right. Go with an original MINI one and your problem will be solved. Really? You want the OP to spend 70 plus shipping on the exact same part he can get delivered free for under 20 dollars and that will solve his problem. It's this type of misinformation from vendors that really gets my goat. I have purchased two of these water pipes form the same vendor on E bay. The pipes are ISO which means they are manufactured to the same international standards as original equipment which I might add is not the greatest design to begin with. I've seen enough planned obsolescence from BMW and MINI to know they are not your friend. 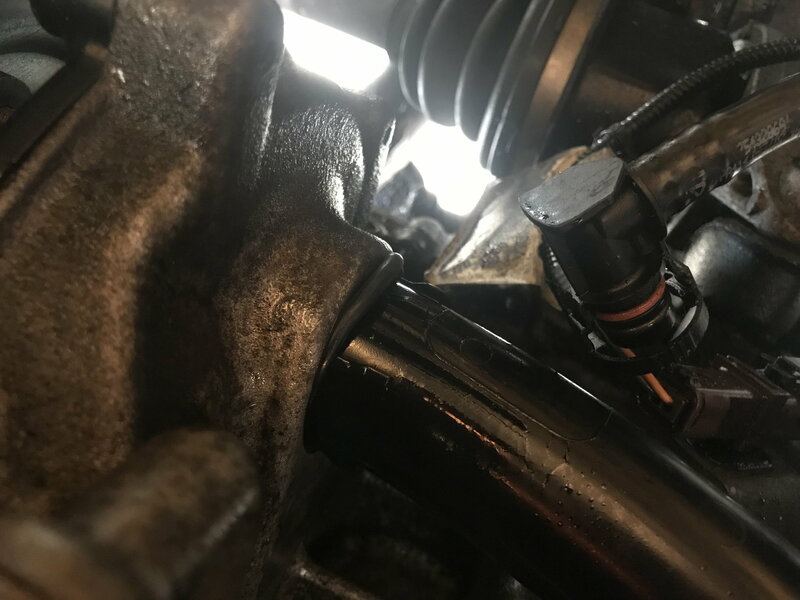 Upon receiving mine and reading this thread I reviewed the part at length with a caliper and tape and found no difference other than two additional spots for attaching the harness wires which is stupid but a BMW / MINI update from my 07 /08. For the pipe to go in it needs to go in with finesse and systematically. From the pictures of the pipe in question it is obvious it is not being lined up exact. Move the main wire harness out of the way as well as all water pipes so you have proper access to the work area. Make sure you have the proper size socket and extension so you are not fighting the room available. Make sure the pipe has clear travel (it is on the block side of vacuum lines and fuel rail harness. Is the intake support bar bent and in the way, blocking path where pipe goes? Assure the threads for the thermostat housing are clean and square and not buggered up from attempting to install the pipe crooked thirty plus times because the intake support was bent and blocking proper access for the pipe? 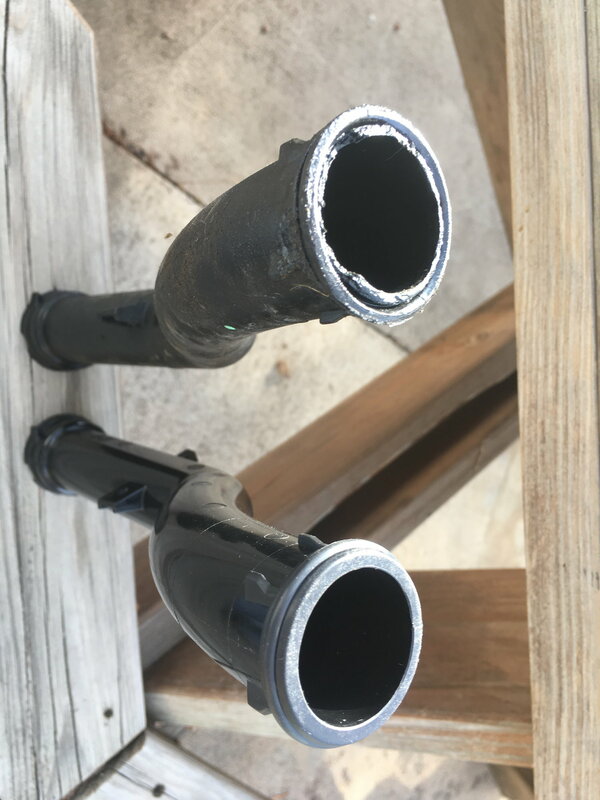 Spray both ends of pipe with silicone spray. Fit the pipe into position. Attach thermostat housing to pipe making sure tab fits into notch on pipe and attach clip. Start all three T-Stat housing bolts with just a thread or two. Reach with your left hand and you can feel if the pipe is lined up proper with the whole on the block / water pump. The same amount of o ring is protruding evenly around the opening. Then and only then.... keeping the thermostat housing evenly away from the head, give each one of the t-stat housing bolts a full turn one at a time. Keep working the bolts evenly. This will draw the housing in square with the other end where the pipe is going into the block. If you didn't line up the housing and the pipe in its proper position, it will push you crooked and crack the end or your pipe. If you try drawing the bolts in one at a time ..... guess what. Is it possible to get a bad part from a vendor...... sure. Is it likely...... no. Not with ISO. Confirm with old part before attempting install. I spend a lot of money with ECS.... glad you guys are there but there is nothing out of spec with the parts I've been receiving from E-bay / CHEYNA. All auto manufacturers receive parts from China. It's a global economy now. I'm NOT posting misinformation as I personally have tried to use aftermarket pipes, hell I even have one sitting on my desk that won't fit. And it does look identical to the OEM one, but it's off just enough that it won't fit. If you read around you'll find I've been working on MINIs for 17yrs, yes since day one, and I'm a no BS guy and don't just try to sell products. If I had found cheap aftermarket pipes to fit I'd sell them and hell they would be more profitable than the original MINI one. But I have found they don't work and multiple times run into this situation with other customers calling me telling me they can't get them to fit or sending me pics of them not fitting. So I know 100% that there are issues with aftermarket water pipes. So I'm going to advise customers to spend the extra bucks to get a known original MINI coolant pipe so when they take their car apart they will know it will go back together and not have delays in ordering another one as that has more value than the extra cost of the original vs aftermarket. I'm glad you got them to work. But if the aftermarket pipe isn't the issue why is the poster of this thread having issue? It can't be misinformation if that's is issue. Nothing fits as well as factory OEM parts. I've been a tech for over 30 years now, have worked on German, Japanese, Chinese, Italian, American, you-name-it. OEM parts fit and work better in my humble opinion. To the OP..... I used dielectric grease on the o-ring and a little bit in the end where the tube fits into the back of the water pump housing area. It slid right in once it was properly indexed. There was no need to use the thermostat housing bolts to "draw" anything together. Definitely more of a "feel" thing than being able to see anything. You may need to source a new o-ring if that one has been damaged by your previous attempts, or has been contaminated by anything that may cause it to swell. Honestly, I am hoping you have the job done by now. Also what would help the OP out is to remove the intake manifold. I replaced my thermostat and water pipe this weekend. Removing the intake manifold allowed me to see where I was placing the water pipe. Otherwise now way could I have gotten the pipe orientated correctly. Also clean out the water pump area. I ran my finger around the hole and could feel debris. After cleaning it out and liberally lubing up both ends ( I used dielectric grease. ) it took quite a few tries to get the pipe into the water pump section. Then quite a few tries to get the thermostat into the other end. I got my parts from FCP Euro. They are an OEM parts seller. thanks for all of the info. i haven't put the pipe in yet b/c i've expanded my "repairs" to the clutch. to answer frankblack - at the time of the post i had the intake manifold out and as much of the wiring harness as i could manage. i did return the original part and bought an OEM - not mini but a brand sold by pelican parts. i'm hoping it will work. the issue for me was the o-ring. the pipe fit in nicely but the o-ring was much larger than the opening at the water pump. i'm wondering if it was the wrong part or if it stretched - it was already on the pipe when it was delivered. the new part had the o-ring in its own bag NOT on the pipe. i haven't held it against the opening yet but i'm hoping it will be a closer fit. i'm also hoping the install will be easier since having removed parts for the clutch job i'll have clear access from above and below. MWMWMWM - thanks for the advice on installation process. i'll be sure to follow that very closely. I coated the water pump end of the pipe with silicone grease, (kind plumbers use on rubber seals) to ease installing the tube. Lined it up with the water pump hole, held a small piece of wood on the thermostat housing side and tapped it in with a small hammer, (two taps). This was installing an OEM pipe with the intake manifold removed.